I want a minimap. This is sort of the same story as with the fog of war. The game needs a minimap, because it’s way too easy to miss a door and spend 10 minutes running around looking for that exit or that one boss room you missed. 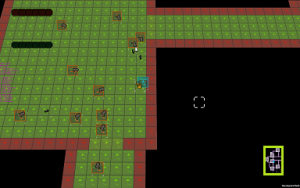 I need the player to quickly see the dungeon layout. It’s one of those features that’s not exactly easy to do and involves lots of moving parts and maintenance, so I have to justify it to myself. And players just walking around aimlessly seems like a pretty convincing argument. This follows the same logic as the tile visibility — all connected rooms are revealed at once. And finally this works and functionally does pretty much everything I need. The player can see all the rooms they visited. It hides unexplored areas. It reveal halls and shows where rooms likely are. If they get lost, they can quickly find any rooms or halls they have missed. 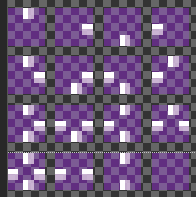 In any case, I can tweak sprites and sizes later. That way the minimap is always centered the same regardless of the dungeon layout, so the player can’t make any assumptions about the actual dungeon layout (size or shape or spawn room location in relation to the rest of it) from the minimap. I could eventually indicate more stuff, like bosses or treasure, just so the player has a point of reference. 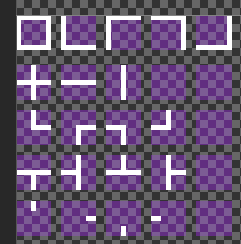 But I will come to that once I add them properly to the dungeon and mark the relevant rooms as such. Also, I won’t be doing a full-screen map. 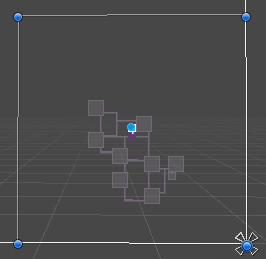 I could just zoom in my current minimap, but it feels pointless. I rather make it a scaling option or something, separately or as the whole UI. 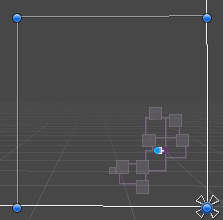 I also won’t animate the minimap reveals because I don’t see much point — it’s tiny and HUD-only. And I think this pretty much covers this self-contained feature.